The Business & Enterprise Management internship is designed to provide students the opportunity for a meaningful career-related experience in a variety of organizational settings. The undergraduate school’s Business and Enterprise Management Internship program is designed to give students unique learning opportunities to gain valuable experience, apply their skills, and make business contacts. Students are expected to seize these opportunities and maximize the internship’s learning potential. The intern will assume both an employee and a student role simultaneously. As an employee, the intern must perform assigned duties satisfactorily. All company regulations, health and safety conditions, and legal requirements apply, and any company policy violations should be handled in the usual way. Also classified as a Wake Forest student, the intern is subject to all applicable university regulations. Work a minimum of 200 hours over a minimum of five weeks. Prepare job responsibilities and outcomes for the internship, which should be developed cooperatively with input from the Director of Internship Development and the Supervisor. Compile reports on a weekly basis (bi-weekly during a Fall or Spring semester) with a status report/journal. Compile a final report/narrative reflection. Prepare a professionally oriented Internship Portfolio that showcases their work. Maintain contact with the faculty member as appropriate, throughout the internship. Note: No internship credit will be granted for work already in progress or completed. Approve job responsibilities and intended learning outcomes, which the intern has developed cooperatively with the faculty member, and the supervisor. Provide ongoing, informal feedback to the student about his/her work performance. Complete an initial and final evaluation of the student’s internship using a form provided by the School of Business. The evaluation should include a face-to-face meeting between the supervisor and the intern, and a copy of the evaluation form must be sent to the supervising faculty member. To promote a mutually beneficial relationship, the student, the faculty member and the supervisor should maintain contact throughout the semester. If questions or concerns arise, the supervisor is urged to communicate with the Director of Internship Development. Such contact is welcomed and appreciated. The BEM Internship Database contains companies and contacts who have expressed interest in hosting WFU interns or have hosted WFU interns in the past. Once you have confirmed details for your proposed internship, fill in the form at the link below and hit Submit. Bringing the Business and Enterprise Management curriculum to our students is an ambitious undertaking. It not only relies on the substantial talents of our faculty, but also on the proactive involvement of forward-thinking companies and alumni. Whether you represent a business or are an alumnus, we’re eager to get you involved in this exciting program. It’s a win-win partnership for you and our students! If you are interested in recruiting Wake Forest BEM majors for potential internship opportunities, please contact Gigi Parent at parentel@wfu.edu or call (336) 758-6107. The answer varies greatly by organization. Some internships are paid hourly while other organizations choose to provide a stipend for the full internship (amounts vary). Some organizations may provide housing and expenses, but the internship is unpaid. Some internships are completely unpaid. Approximately 25% of our students have indicated that they are only eligible for paid internships. What are the appropriate dates of the internship? The dates vary significantly but generally fall in the late May to late August range. How will student housing and expenses be paid? These arrangements are generally the responsibility of the student. Gone are the days of using interns as simple”go-fers.” Students have many talents and traits that benefit employers: enthusiasm, dedication to learning, and an eagerness to work and do a good job. A good internship program will ensure the assignment of challenging projects and tasks. Don’t underestimate their abilities. Effective assignments are coupled with adequate supervision so as to provide an information resource and to ensure interns are keeping pace. Use care in identifying a seasoned staff member who “buys in” to the importance of utilizing interns. Develop a detailed job description for the student intern. Involve the manager who will be responsible for supervising the student in the development process and discuss requirements with student intern. Discuss “learning objectives” with your interns and supervisors. Plan ongoing weekly meetings to stay up-to-date with the intern’s progress. Provide an orientation to your organization. Introduce the student to the organization, the employees, the physical layout, and the order of responsibility. If possible, have supervisors encourage students to participate in your organization’s training programs as well as cross-department assignments. Involve supervisors and students in a formal evaluation process. An evaluation form will be provided for you at the midpoint and the end of the internship. Take some time to review the evaluation with the student intern. Give the intern the opportunities to apply education and skills. Assign projects that include such elements as planning, designing, evaluating and researching. 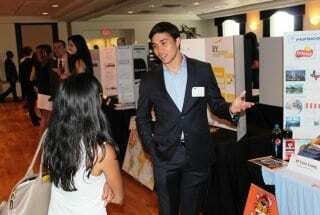 Click the links below to view Flickr slideshows of past BEM Internship Table Top Tradeshows. The purpose of the BEM Summer Work Fellowship is to provide financial support to students who might not be able to accept an unpaid or low-paying internship without other financial assistance. All rising BEM seniors are eligible to apply for up to $3,000 to aid in the completion of the required BEM internship. The intent is to award the full amount of $3,000 to those applicants with unpaid internships. The BEM Summer Work Fellowship is intended to fund those internships you list in the application. Accepting a different internship will require a new application for funding. If after receiving the fellowship a recipient finds that his/her position is paid, s/he may submit a request for up to $2,000 to help cover internship expenses. Decisions about these requests will be made based on the projected net costs stated in your application and will be contingent on available funds after all unpaid internship applications have been considered. Fellowships are intended to help cover living expenses for students completing unpaid or low-paid internships during the summer semester. Fellowship funds are not intended to cover tuition at other universities, payments to third-party search companies, or other costs not directly related to the completion of your BEM internship. Fellowship decisions will be made on a rolling basis, with a priority given to students who have an internship offer in hand. Fellowships are determined on the basis of both merit and need, using a competitive application process. Click here to apply. Questions regarding the BEM Summer Work Fellowship should be directed to Mrs. Gigi Parent, Director of Internship Development (parentel@wfu.edu). The Price Foundation grants funds for internships with nonprofits or organizations with a social function. These scholarships are up to $5,000 to encourage students to engage with organizations that have a social mission but are not likely to be able to pay for an intern. The scholarships are available for internships in the spring/summer/fall semesters. Please email Holly Brower to apply, stating the nature of your internship, the social focus, and the desired internship dates. As a condition of accepting the funding, you will be expected to write a final report (your BEM portfolio will meet this requirement) and a letter of appreciation to the Board of Directors of the Price Foundation indicating the value of your internship and major take a ways from the experience. Questions regarding the Price Scholarship should be directed to Holly Brower (browerhh@wfu.edu).